A companion app for Core First symbol communication software. Pathways for Core First companion app is ideal for parents, caregivers, and communication partners looking for expert guidance and best practices for engaging Snap + Core First users. Pathways will help you jumpstart communication goals with intuitive video examples, lesson plans, and an interactive goals grid for tracking progress and addressing behavioral challenges. There's also a suite of supporting digital and printable materials to help you along the way. With Pathways, you will have an expert guide to help you get the most out of Core First. Tobii Dynavox Pathways is a free, one-of-a-kind companion app for Core First® packed with expert advice to impact communication success, and to assist in the journey to literacy and independence. Designed to facilitate successful use of Snap™ + Core First® software, Pathways is a unique learning gateway that will enhance your partner communication skills. It features an interactive goal setting tool, lesson plans and materials, cheat sheets, and videos. With an intuitive dashboard and Getting Started walkthrough videos, you can instantly get up and running with examples supported by scripts and videos, all while encouraging communication and interaction. Use the interactive Goals Grid to determine the goals for users of all ability levels. Easily monitor and share progress, while keeping momentum with lesson plans to address every goal. Pathways for Core First shows you how to implement Snap + Core First with real-world video examples for each lesson plan and materials. Communication is a two-way street, and being a good partner is even more important when your user’s skills are developing. Pathways will teach you skills that are proven to facilitate engagement, communication, and language growth. Our goal for every communicator is to expand literacy skills, gain independence, and to encourage engagement to their full potential. Pathways is an easy-to-use app that will show you how to accomplish that, no matter how much or little experience you’ve had with augmentative and alternative communication. Our Top Tips introduce you to skills to facilitate communication development and share them with others. 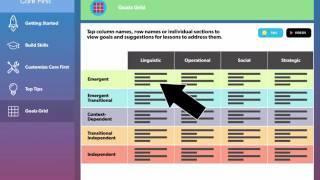 The Goals Grid provides functional goals addressing language skills, device operation, social skills, and strategies for repairing communication breakdown. These goals help you identify the user’s starting skill level and which skills require more focus. Learning these core skills with Pathways empowers users with the ability to communicate independently in any environment. Over 50 lessons are available for growing skills in a variety of areas. Find the lessons by selecting goals in the goals grid or directly through the Build Skills section. Additionally, the Encourage Positive Behavior section provides assistance for matching supports to specific behavioral challenges. Pathways for Core First is also available as an online version accessible directly from your web browser. The online version is more step-by-step than the app version but can also be self-directed. This makes it ideal for those who would like direction on implementing Snap + Core First but with less experience and/or knowledge of how to do so. Use it to help you setup and use Snap + Core First for the first time and to expand the user’s skills. Pathways Online is available in four different languages - English, German, Spanish, and Dutch. Click below to get direct access to Pathways Online in your preferred language.